For use w/the Ultimate Yoke Dress includes 12 collar shapes & variations for the high, raised & dropped yoke dress. 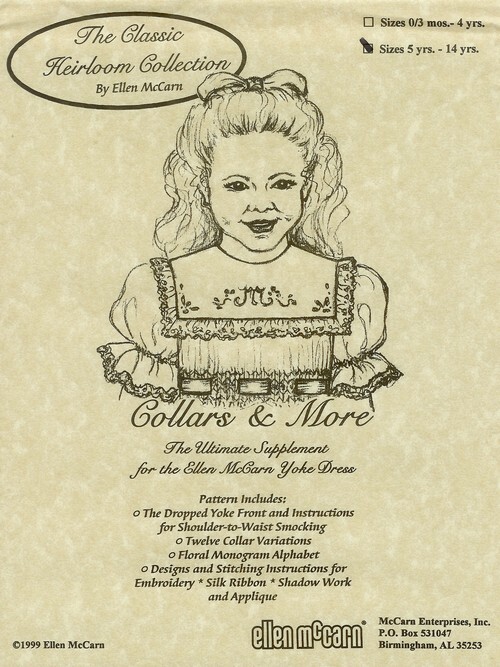 The Dropped Yoke Front pattern pieces that go w/the Ultimate Yoke Dress are included in this pattern for those wishing to have an unsmocked garment with the larger collar. Also included are designs & detailed instructions for basic embroidery, Silk Ribbon embroidery, Shadow Work & Applique.